The OlivetDiscourse is an important passage for the development of anyone's view of Bible prophecy. The Olivet Discourse is made up of our Lord's teaching on Bible prophecy that is found in Matthew 24-25, Mark 13 and Luke 21. Since one's interpretation of the Olivet Discourse greatly impacts whether they are a premillennialist or anti-millennialist, futurist or preterist, or pretribulationist or posttribulationist, I will be attempting an extensive interpretation of Matthew 24-25. In spite of the fact that the Jewish people deserved the approaching judgment, like a caring parent about to administer a just punishment, Christ cries out, "O Jerusalem, Jerusalem, who kills the prophets and stones those who are sent to her! How often I wanted to gather your children together, the way a hen gathers her chicks under her wings, and you were unwilling" (23:37). Jesus wants to gather His people (as He will in 24:31), instead, He will scatter them via the a.d. 70 judgment (Luke21:24). Jesus then declares in verse 38, "Behold, your house is being left to you desolate!" To what does the house refer? In the context of this passage it must be a reference to the Jewish Temple. Matthew 24:1-2 brings up a discussion by Jesus with His disciples about the Temple. It is at that time that Jesus startles them by telling them "'Do you not see all these things? Truly I say to you, not one stone here shall be left upon another, which will not be torn down'" (24:2). What Jesus says will be desolate, the Temple, in 23:38, is more precisely described in 24:2: both referring to the same thing - the Temple. But then He declares that they will not see Him again until they say, Blessed is He that cometh in the name of the Lord. This is a messianic greeting. It will mean their acceptance of the Messiahship of Jesus. Dr.David Cooper echoes Dr. Fruchtenbaum's understanding when he says, "Since Jesus came in the name of the Lord, and since He will not return until Israel says, 'Blessed is he that cometh in the name of the Lord,' it is clear that the people of Israel will see and recognize that Jesus was and is their true Messiah." The last few verses of Matthew 23 means that judgment was coming in the near future, but, beyond judgment, deliverance and redemption awaits the Jewish nation. Judgment did come in a.d. 70 and Matthew 24 speaks of the still future redemption of Israel. Matthew 24:1-3 provides us with the setting for which Christ delivers His prophetic sermon. We see that Jesus is making His way from the Temple (24:1) to the Mount of Olives (24:3), which would mean that He most likely would travel down the Kidron Valley and on up to Olivet. As He was going from the Temple "His disciples came up to point out the temple buildings to Him" (24:1). This statement leads us to believe that they were talking to Jesus about how beautiful the Temple complex was that Herod was still in the process of remodeling and refurbishing. Such an emphasis is borne out in the parallel references in Mark 13:1-2 and Luke 21:5-6 as the disciples speak of the beauty of the Temple buildings. The Lord must have startled His disciples by His response to their gloating over the beauty of the Temple complex when He said, "Do you not see all these things? Truly I say to you, not one stone here shall be left upon another, which will not be torn down" (24:2). As 24:2 is completed, with Christ's statement, there is a break in the narrative. The narrative picks back up in 24:3 when it says, "the disciples came to Him privately." Mark 13:3 tells us that the disciples who came to Him privately were Peter, James, John and Andrew, and that they were sitting on the Mount of Olives looking at the Temple. 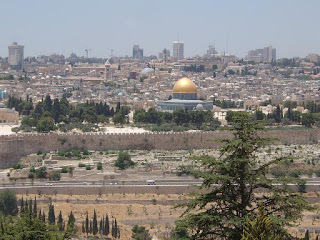 This would be the same vista that many have seen today when a visitor goes to the viewing point in modern Jerusalem on the Mount of Olives that overlooks the Temple Mount with the Dome of the Rock perched upon it. That the disciples came to Jesus privately fits the pattern that Jesus practices and Matthew records of teaching only His believing disciples once the nation rejected Him as their prophesied Messiah in Matthew 12. From Matthew 13 on, Jesus speaks publicly to the rejecting nation only in parables (Matt. 13:10-17). "Therefore I speak to them in parables; because while seeing they do not see, and while hearing they do not hear, nor do they understand" (Matt. 13:13). However, many times He would later explain a public parable privately to His disciples (for example, Matt.13:10-23). In the Olivet Discourse, we see Christ following this pattern. This private explanation, which is the Olivet Discourse, means that Christ will provide His explanation of future history for the benefit of believers. This means that the two phrases are closely related to one another in the mind of the disciples, who formulated the question. They believed that they were linked closely together. Clearly the first question relates to the destruction of the Temple, which was fulfilled in the Roman invasion and destruction of a.d. 70. It is equally clear that the two aspects of the second question have yet to occur in history, even though some want to see in this passage Christ's second coming (more on the errors of preterism as I progress through the passage). It appears likely to me that the disciples believed that all three aspects of their two questions would occur around the same event - the coming of Messiah. Why would they have thought this way? Dr. Toussaint is correct to note that the disciples were influenced by the prophet Zechariah. In other words, the disciples thought that all three events were related to a single event - the return of the Messiah as taught in Zechariah 14:4. As we shall see, they were right to think of Zechariah 12-14 and his teaching about Messiah's coming. However, they were wrong to relate the impending judgment of Jerusalem and the Temple with the return of Messiah, as I hope to show in future installments of this series. Maranatha! Tim LaHaye and Thomas Ice, Charting the End Times: A Visual Guide to Understanding Bible Prophecy(Eugene, OR: Harvest House, 2001),p. 35. Stanley D. Toussaint, Behold The King: A Study of Matthew (Portland: Multnomah Press, 1980), pp. 264-65. Alfred Edersheim, The Life and Times of Jesus the Messiah, 2vols. (Grand Rapids: Eerdmans, 1974 ), Vol. II, p. 414. Arnold Fruchtenbaum, The Footsteps of the Messiah: A Study of the Sequence of Prophetic Events (SanAntonio: Ariel Press, 1982), pp.212-15. David L. Cooper, Messiah: His Final Call to Israel (Los Angeles: Biblical Research Society, 1962), p. 47. Craig L. Blomberg, Matthew, Vol. 22 of The New American Commentary (Nashville: Broadman Press, 1992), p. 353, f.n. 37. Toussaint, Behold The King, p. 269.